Hook and loop strap designed for riders who need help keeping their legs in proper alignment over the pedals. Available in 3 sizes: small, medium, large. Sizing is the circumference of the thigh jst above the knee. 6-9 inches = Small. 10-14 inches = Medium. 15-19 inches = Large. Please Select a Size - The size is based on the leg circumference just above the knee. 6-9 inches = Small. 10-14 inches = Medium. 15-19 inches = Large. Available in 3 sizes. 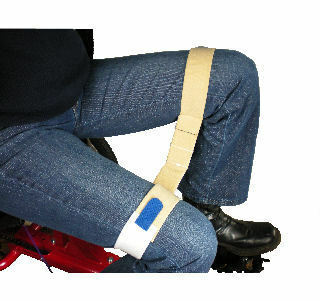 Hook and loop strap for riders who need help with keeping their knees together so that the hamstring muscles can push down against the pedal. Sizing starts with the circumference measurement of the thigh just above the knee.